The longest experiment of all times: Instant Pot Chicken. How long to pressure cook a whole chicken, chicken legs, chicken thighs, chicken drumsticks, chicken wings AND chicken breasts. I’ve got chicken coming out of my ears now! First the bad news. Um, I’m never eating chicken again in my life I think. Ew! I’m also never eating rice again after my Instant Pot Rice post. Only veggies for me the rest of the month please! 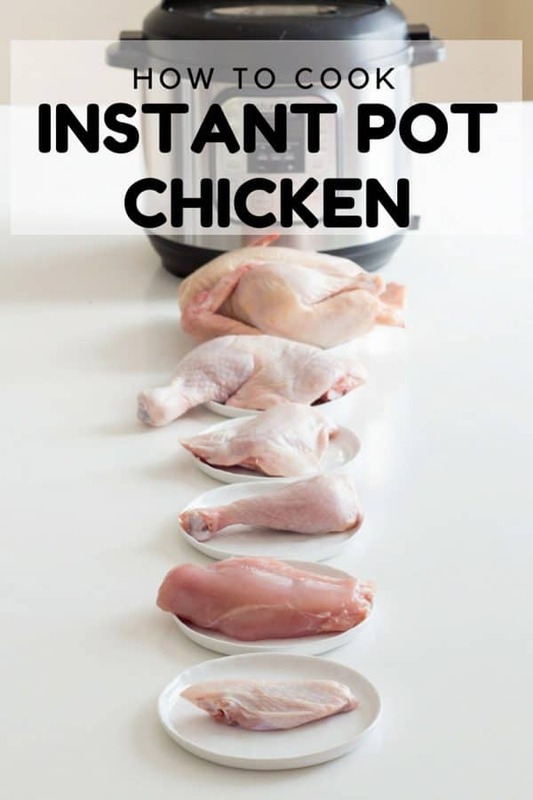 Here is your Instant Pot Chicken Encyclopedia! Before I start. This is all for thawed (NOT FROZEN) chicken and chicken parts. AND it’s all cooked on the trivet with water at the bottom, not touching the chicken. You can add whatever seasoning or sauce you want. Or you can cook it on top of rice or beans or whatever else cooks in the same amount of time. This is simply the minimum times you need to have the chicken or chicken parts IN there. I actually just created a cheat sheet for just that. Which things can be cooked in the Instant Pot at the same time, i.e. what can cook equally long? Chicken thighs with brown rice? What’s all I can cook in 3 minutes high pressure? This and much more…. Now let’s get to the details. Shall we? Warning: this is a VERY long post talking about my experiments and results. If you’re in a rush, you can just Jump to Recipe and there I list just the results. So the interweb research said 25 minutes pretty much for any size chicken. Some tested a 3lbs chicken, some tested a 4 lbs chicken, nobody tested both or more at several different times. I wanted to find the magic formula for consistent results because not all my chickens are always the same size, right? SOOOO, I cooked 3lbs (1300 g) chickens at 18 minutes, 23 minutes and 25 minutes. In all three experiments the internal temperature made it to 165F so a small chicken basically CAN “in theory” be cooked for 18 minutes only. HOWEVER, the thighs and drumsticks were not nice and tender and rather weird in texture. Plus, there were just a little bit not so clear juices but lightly pinkish (temp was fine though, inserted into both thighs and breasts, so safe). 23 minutes was perfect and 25 minutes was great. No major difference to be honest so I’d say 23 minutes is the magic number for a small chicken 3 lbs and under. The big chickens 4lbs 7oz (2000g) I tested at 22 and 25 minutes. 22 minutes just barely got to 165F (4 minutes into resting period) but same as for the small chicken after 18 minutes, the texture wasn’t really that perfect. The one cooked for 25 minutes was absolute perfection. Holy cow – or maybe I should say holy chicken – this was the one that gave me the biggest headache. So first I tested three 10-oz (280g) breasts at 4 minutes, 5 minutes and 6 minutes. After 4 and 5 minutes it didn’t make it to 165F in the resting period but the 6 minutes one was at 155F after opening and within 4 minutes resting time made it to 165F internal temperature. My conclusion then was approx. 2 minutes per 3.5 oz (100g), right? WRONG! If you cook a 3.5 oz (100g) tiny chicken breast for 2 minutes it’s totally overcooked (like 200F kinda overcooked). Also, I’ve cooked two same weight but different thickness breasts at the same time but they had different internal temperatures after cooking. Naturally, the next experiment was thickness. A 1.2-inch thick (3 cm) breast cooked to 165F in 4 minutes. My conclusion then was 50 seconds for every 1/4 inch OR 1 minute for every 3/4cm, right? WRONG! Because a 1/2-inch chicken escalope was completely overcooked after 2 minutes (like 200F kinda overcooked). By now I’m about to give up, right? 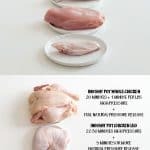 Only, I’ve already tested 1/2-inch chicken escalopes and tiny chicken breasts, medium sized 1-inch thick 7-oz (2.5cm/200g) chicken breasts and large 1.5-inch thick 10 oz (4cm/280g) breasts and I know at what times they properly cook through without completely overcooking. Now, before we jump to the next category, I’ve got to confess one thing. I didn’t like the texture of any of the pressure cooked chicken breasts. My favorite method to cook chicken breasts is and will always be pan-fried. It gives the juiciest and softest breasts of all. HOWEVER, for mixed things like Instant Pot Chicken and Rice it’s awesome!! To choose which rice you want to cook with which piece of chicken check out this Instant Pot Rice guide. OR cook it in a ton of delicious sauce such as in this Instant Pot BBQ Chicken recipe and it’ll taste absolutely amazing! The whole leg or just thighs and drumsticks are a lot easier to cook. AND, they taste amazing pressure cooked. Not like the breasts. They become super tender and delicious! There is a much higher margin for success. Where breasts shouldn’t be overcooked or they become mega dry, all the bone-in parts are way more forgiving and actually benefit from overcooking because the longer they cook the softer they get and the easier they are to pull apart from the bone. Of course, there is an upper time-limit but it’s REALLY high. So the least amount of time whole legs seem to need (independent of size) to get to the safe 165F is 18 minutes but it’s hard to remove the meat from the bone after such a short time. The longer you cook it the more tender it becomes and more fall-off-the bone. I’ve cooked it at 22 and even 30 minutes and at around the 22-minute mark it becomes really tender and still at 30 minutes they were great. So I’d say 22 minutes is great if you’re cooking them alone but you can go all the way to 30 minutes if you’re cooking them with whole sweet potatoes that need that long or wild rice for example. I haven’t tested cooking them to 30 minutes but “in theory” they should be just fine because if the whole leg is fine up to that time the individual parts should be, too. My goal testing was finding the minimum time, clearly. Chicken thighs at 10 minutes high pressure + 5 minutes natural pressure release got me the 165 F but with slightly pink fluid and very hard to remove rom the bone. Extremely weird texture. At 15 minutes high pressure they become extremely tender and fall-off the bone. I myself have cooked them for up to 22 minutes and full natural pressure release and they were still divine. Super soft and juicy. For drumsticks I noticed that 15 minutes seems to be the absolute minimum for starting to soften down. Anything under may make it to safe temp but not fall-off the bone. I myself have cooked to up to 22 minutes and just like the thighs they were divine. Super soft and juicy. Almost all recipes I found online all suggested 5 minutes HP + different times natural pressure release. The 5 minutes did get them to the safe 165F after the resting period BUT they were far from fall-off the bone. Just like for the whole legs or just thighs and drumsticks longer cooking equals more tender and fall-off the bone meat. Chicken breasts and bone-in dark chicken really cook completely different. Anyhow, after a 10-minute high pressure cooking time + 5 minutes or more natural pressure release I noticed they become nice and tender. The wings of the big whole chicken that cooked for 25 minutes had perfect wings, too. So I guess 25 minutes is still fine. 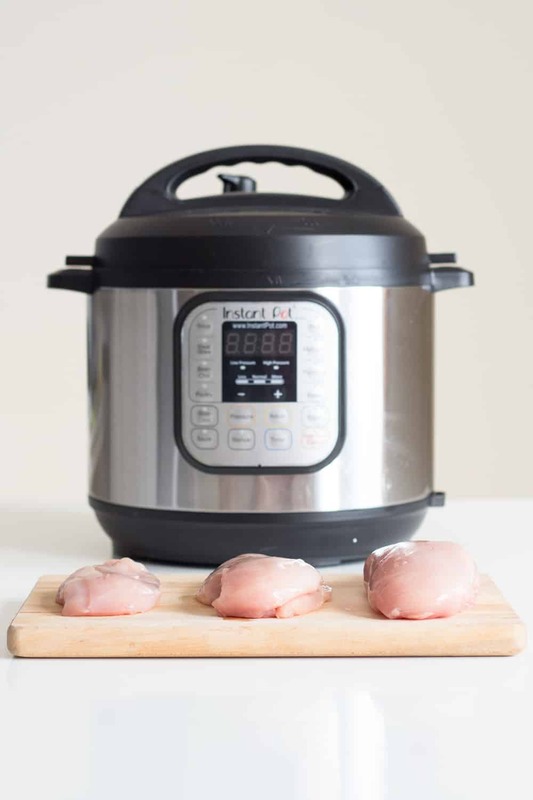 Leave Skin On Or Remove When Making Instant Pot Chicken? I’m a big advocate of always leaving the skin on, at least if you’re cooking only the chicken. If you’re cooking it on top of rice for example, the dripping fat WILL mix into the rice. You’ll have to decide if you’re ok with that depending on how fatty your other meals were during the day. When you’re cooking only chicken on the rack with water in the bottom, the fat will drip into the water but the skin will keep the meat moist. Now, be aware that the skin will NOT crisp up when cooked in the instant pot. It will be rubbery and yucky. You have two options after your chicken is cooked through. Either remove the skin and discard OR put under the broiler for a couple minutes for it to crips up. Always let the pressure release naturally for at least a couple of minutes or you risk of all the steam evaporating really quickly and drying out the chicken. The internal temperature for safe consumption of chicken (yes, all parts of it) is 165F. This does not mean that the chicken has to be at 165F right after opening the lid of the pressure cooker. For chicken breasts always aim for rather 155F. Within 4-5 minutes the temperature will rise to 165F. If you aim for 165F right after opening the lid, you’r chicken will overcook during resting time. ALWAYS, let chicken rest at least 10 minutes after cooking before cutting into it. If you cut into it right away all its juices run out and you’re left with extremely dry meat. Chicken parts with bones in them are safe to eat at 165F but not tender. Always aim for rather 185F or more for those parts to get to fall-off-the-bone consistency. The longest experiment of all times: Instant Pot Chicken. How long to pressure cook a whole chicken, chicken legs, chicken thighs, chicken drumsticks, chicken wings AND chicken breasts. I've got chicken coming out of my ears now! Add trivet into instant pot, add 1 cup water, add whole chicken or 1-2 chicken legs (in one layer), 2-4 chicken thighs (in one layer), 2-6 chicken drumsticks (in one layer), 1-4 chicken breasts (in one layer), 2-12 chicken wings in one layer. WHOLE CHICKEN: 20 MINUTES + 1 MINUTE PER LBS HIGH PRESSURE + FULL NATURAL PRESSURE RELEASE. Hi! Thank you SO much for your dedication to accurate methodical info. I am curious if you have tried further cooking with the weird texture pieces that were safe but unpleasant. I intend to use my pressure cooker to pre cook chicken pieces and then “pan” fry them later at dinner time, so they will cook more quickly (because you can’t deep fry in a pressure cooker). I’m wondering if the texture would get better with frying after minimal cooking. My issue is that I don’t want fall off the bone chicken if I need to handle and continue cooking them later. Hm, I’ve never thought of pan-frying afterward. It could definitely improve the texture of chicken breasts. Chicken thighs come out nice in the instant pot and what I’ve done already is pressure cook and then broil so the skin gets nice an crispy. I can imagine that if you cook chicken thighs and then store in the fridge till dinner time and then just pop in the hot oven for about 5 minutes + 5 minutes broiling they are reheated and nice and crispy? Hi do you have any recommendations on the timings for 8-10 large chicken legs stacked up? Also how much extra time would you add if they were frozen? The time “should” be the same for 1 or 10 chicken legs, even if they are stacked. Use the longest chicken leg time suggested. The only thing I’ve tried from frozen so far is skinless boneless chicken thighs and 30 minutes worked well. I haven’t experimented any more with frozen chicken, so no advice, I’m sorry. Thanks so much for this guide! I’ve used it for numerous forms of chicken and it is a great resource. Love the way chicken is so tender in the InstantPot! And the leftover broth even is practically bone broth! I keep the bones to make actual bone broth, so multiple usage! Thanks for this post. It is a big help. I was really disappointed with the instruction that came with my Instant Pot, so I appreciate your hard work. Just a note: I save the juices from the pot, place in the fridge to let the fat gel so I can remove it, then use the juices for cooking Mashed Potatoes or rice. Adds a lot of taste. do you cook your potatoes in the instapot a well? If so, what times? and I assume soup setting? Yes, I cook my potatoes in the IP as well but the timing depends on the potatoes and what I want them for. Mashed, whole baby, etc. I should write a post about that. You just sparked the best idea ever! I never use any of the buttons the IPs have. I use only manual for everything. Small baby potatoes I cook for 5 minutes HP + quick release. Starchy yellow or white potatoes I peel and cut into chunks and then cook for 5 minutes + NPR and by then they are super mushy. Hi, so I usually made baked chicken (seasoned with butter and other seasonings) with potatoes and broccoli in the oven but it takes forever! I tried it in the instant pot using the trivet but all of the juice just went to the bottom where the water was. Can I just pressure cook it with the butter and other items without the water and trivet for better tasting and more flavorful chicken and potatoes? I would! The butter will keep it from sticking. Not all heroes wear capes. Thank you so much!!! all the hearts in my eyes! Thank you for your amazing comment! I think stacking them with trivets you’ll be able to cook at the timing I suggest. Putting one on top of the other you might have to add a couple minutes pressure cook time (not double, just a couple minutes 2-3 more) to make sure they are cooked through. Sorry, one more question. You are spot on about chicken tasting best pan fried on the stove. However I frequently have to cook in large quantities. I have tried both IP cooking and sheet pan cooking with and without parchment paper. The IP came out better because I used the sauté function to brown them and then had a broth-based sauce. But I wondered if you had any advice? Thank you again. Hi Jessica, on what exactly do you need advice for here? This was an awesome article! I am a new IP user. I was wondering if you could explain (or direct me somewhere) about the pressure release. I hear terms like “quick release” and “manual release” etc. How do I know how long to leave something in for after the pressure cooking has completed? Thank you, I really appreciate it. 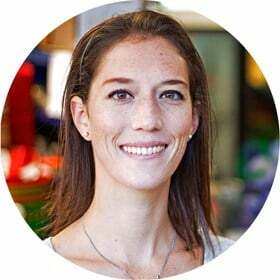 Hi Jessica, “quick release” means once the pot peeps telling you the pressure cook time is over you turn the valve to the venting position and let all the pressure out “manually” which is why it’s also called “manual release”. Once all the pressure is out, the safety pin drops and you can open your pot. Quick release and manual release are synonyms. They are the exact same thing. “Natural Pressure Release” often abbreviated “NPR” means you do absolutely nothing once the pot beeps telling you the pressure cook time is over. You leave it untouched and you don’t even look at the valve. Leave it in the sealing position. Over time the pot will release all the pressure naturally and the safety pin will drop once all the pressure is out all on it’s own. That’s when you can open the pot and you food is ready. The time it takes a pot to naturally release pressure varies depending on volume and what you are cooking. It’s always different. It’s usually anywhere from 10-40 minutes. If cooking 1 cup of rice it’ll be closer to 10 minutes, if cooking a large quantity of chili con carne or similar filled all the way up to maximum capacity will take more like 40 minutes. I’m fairly new to the instant pot. I want to make chicken noodle soup. The receipe calls for 2 lbs bone in chicken, with at least one breast. It says I should cook it for 8 minutes. My husband bought a whole chicken but he’d already cut it up before I got home. Based on the price I’m asssuming it’s around 4 lbs. How long should does it need to cook? Do I follow the whole chicken time of 25 minutes even though it’s been cut up? 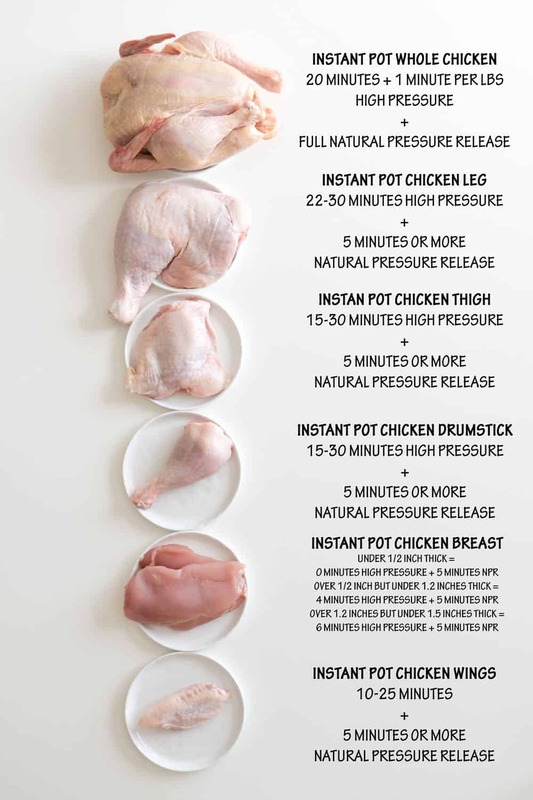 Angie, I’ve never tested this myself but I would assume, even if you add all the parts at the same time you just have to cook them as long as the part that takes the longest which are chicken legs (22 minutes + full natural pressure release). If I can make a recommendation: don’t add the chicken breasts. They might dry out because they’re not “protected” by the carcass anymore. Use them for another recipe. In general chicken breasts taste soooo much better made in a pan or in the oven. Use all the other parts for your chicken noodle soup. If you cut up your legs into thighs and drumsticks you should be able to cook all the parts in 15 minutes + full NPR. I didn’t see how much water to use within your processes. Am I to assume that it is always one cut, as that is what I have seen in other recipes for the instant pot. Please help I don’t want to make a mistake. Hi Diane, yes, it’s written in under instructions in the first paragraph. Add trivet, 1 cup water and then whatever piece(s) of chicken you are cooking. This is for the 6 qt though which only needs one cup of liquid to get to pressure. If you have a 8qt you might need 2. Your instruction booklet should say what the minimum liquid is required to get to pressure. You won’t make a mistake :) You can do it!! Great tips! Thanks! I have some bone in chicken breast, do you think I should follow the recommendation for a whole chicken? I’m going for poached chicken, so I’ll cook in flavorful broth. Hmmm. I’ve never cooked bone-in chicken breasts in the IP before. Honestly, I think I would try the regular chicken breast times first and then stick a meat thermometer in them once the pot is open and if it doesn’t reach at least 155F (remember chicken still rises temp a good 10F after cooking) then I would immediately close the lid again and let it come up to pressure again for another 2-4 minutes. I suspect though that the regular chicken breast times till work. Chicken breast cooks much much faster than any other part of the chicken. Brand new instant pot user. So i’ve tried several recipes cooking pork chops, veggies and rice together, also chicken fetticini alfredo. I keep getting a ‘burn’ warning, then the timer stops. I’ve tried spraying with pam prior to cooking, but no good. What am i doing wrong? Marty, I would try making rice as explained in my Instant Pot Rice post. Just 1 cup of whatever white rice with 1 cup water as a test. I have not one single comment about the “burn” message coming up with that recipe. If you still get the burn message there I hope you still have your receipt and warranty. I would go and return the pot and exchange it for a new one. It might be your pot. If the rice recipe works though you might have just been unlucky and come across recipes that are difficult to master in the Instant Pot and require a bit more practice. Usually the burn option comes on when there is not enough liquid in the bottom of the pot and stuff starts sticking to them bottom. Super helpful thanks! Can you marinate the chicken before cooking it in the IP? If you are serving with a side and cooking time is within the same range as for the chicken can you just cook them together ie rice, potatoes, quinoa? Thanks!! I’ve had my IP for almost a year, and have tried it here and there, but am always looking for the basics. I came across this through Pinterest but have signed up. Your website is very good and easy to use. Thanks so much! Thank you so so much for your lovely comment Jennifer! Are the thighs bone in or boneless? For boneless thighs this could definitely work. hello, I need to make 8 boneless chicken breasts at the same time. How do you adjust time for more volume? In theory you don’t. One chicken breast should need just as long as 8. The pot will simply need longer to get to pressure. I have only tested with 1 vs 4 breasts though so I can’t tell with 100% certainty. You can always measure internal temperature right after opening and if it doesn’t reach 165F immediately put lid back and get back to pressure for another minute. I’m SO happy you find this post useful LisaMarie!!! Most useful IP info I have found. I would like to have some guidance on cooking chicken livers. A family favorite are chicken livers wrapped in bacon–either in frying pan or oven. After numerous attempts I have not found a way to do something similar in the IP. Also, I found it very difficult to read the light blue font you used in your email. Would you consider using fonts with more color saturation, as enlarging the font on my end doesn’t help make it easier to read. THANKS FOR YOUR EFFORTS. VERY PRACTICAL. I have read both your chicken and rice guides. I am wanting to cook white rice and cubed chicken. Would I be correct in saying 3/4-1 inch chicken cubes with white rice should cook in the same amount of time? 3min HP then a natural release of roughly 10-12 mins? I know the pressure release will effect the chicken as it almost doubling the release time for the chicken. I want to use the IP for BONE IN chicken breasts…. any suggestions? Ugh…. I’m going to give it a shot at cooking similarly to a bone in thigh/leg. Wish me luck!! Good luck :) It’ll turn out just fine!! I used BONE-IN chicken thighs for this experiment. Cook them for 15 minutes+NPR and they’ll be good. Can’t say anything less than THANK YOU for taking the time to test the cooking time and to share this knowledge. All the time that you invested doing the testing and writing the conclusion to share is very helpful to all of us. Thank you again. Thank YOU Maria for taking the time to come back, comment and rate my post. I really, really appreciate it! This is so helpful! I’m wondering how I would do bone in chicken breasts? Thank you Lorena for doing all the hard work. Can you mix breasts and leg quarters and cook together? If so how do you figure the time? Hi Carol, I haven’t tried mixing and I think I wouldn’t mix. 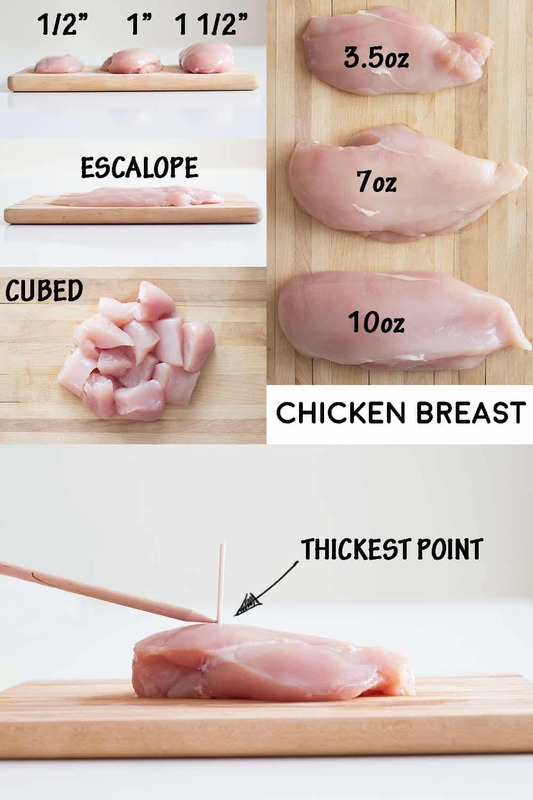 In case of a whole chicken you have a lot of skin on the breasts so they don’t dry out as much while waiting for the rest to cook through but breasts alone will dry out much faster while the leg quarters wouldn’t be cooked through properly. I get what you are saying about the breasts drying out (and I haven’t tried this) but could you wrap the breasts in food safe clingfilm? Hey John, I’m not sure that would make a difference. The problem is that there is no searing process as is when pan frying so the liquid simply flows out of the center of the breast instead of being sealed in. If you wrap it that won’t change. The liquid will simply not wander too far away from the breast but still out of the breast. But that’s all just theory. I might be totally wrong and it works wonderfully. If you try, definitely let me know. 25 mins on high pressures quick release and I usually forget for a few mins. Falls off the bone, fully cooked. OMG! Thank you so much for coming back and letting me know. What a wonderful compliment!! Thank you! This is exactly what I wanted!! I’m so happy you found it useful Jessi!! I recommend leaving it in the fridge until it defrosts because frozen chicken gets super dry in my opinion. If that’s not an option Maybe just add a couple extra minutes just in case but in theory it shouldn’t take longer to cook, just longer for the pot to get to pressure. thanks for the info Jennifer!! Are there any adjustments you would suggest for boneless/skinless thighs? Thanks! Hi Carla, I haven’t tried them in the IP yet. I’m sure they cook faster but probably are just fine at the 15-ish minute mark. I am new to this method of cooking. Your breakdown is very interesting. I’m sure it will be helpful. I find the comments to your posting to be very informative as well. Thank you for this … as I am new to IP cooking. I was wondering how you pan fry your chicken breasts as I agree about the texture after cooking some already. That sounds pretty easy ! Thank you for doing all this work and then sharing your results! How can you cook 0 min at high pressure? Now it makes sense. Good Luck! This is how I cook a whole chicken now (about 3 pounds). Brown and put in IP without the trivet. Quarter an onion (skins and all) horizontally slice a whole head of garlic and rough cut some celery. Put in bottom of pot and add the whole chicken. Cover with water to maximum fill line – don’t worry if an inch or so of chicken sticks over the water. Set to high pressure “000” and NPR for 20 minutes. You will be left with amazing chicken to BBQ under the broiler, use for quick recipes or whatever. Strain the stock (this is better than anything you can buy and defat it the next day for soups, etc.) – you will need a large container. Wait, you cook on high pressure for 0 minutes and then pressure release 20 and that’s enough for a WHOLE chicken?? If I wasn’t so grossed out with chicken I would totally give this a try immediately. Impressed! It’s because it takes so long to reach pressure that the chicken is cooked by the heat and building pressure of it actually trying to reach its final pressure. I did this accidentally one time and the chicken was amazing, as was the stock! I am just learning about my Instant Pot and I love this breakdown. I have done leg of lamb which was very good, mussels – delicious, and beef bone broth. Your post is going to help so much! Thank you so much for this. I am just learning about my Instant Pot and I love this breakdown. I have done leg of lamb which was very good, mussels – delicious, and beef bone broth. Your post is going to help so much! I make dogfood with a 10 lbs. 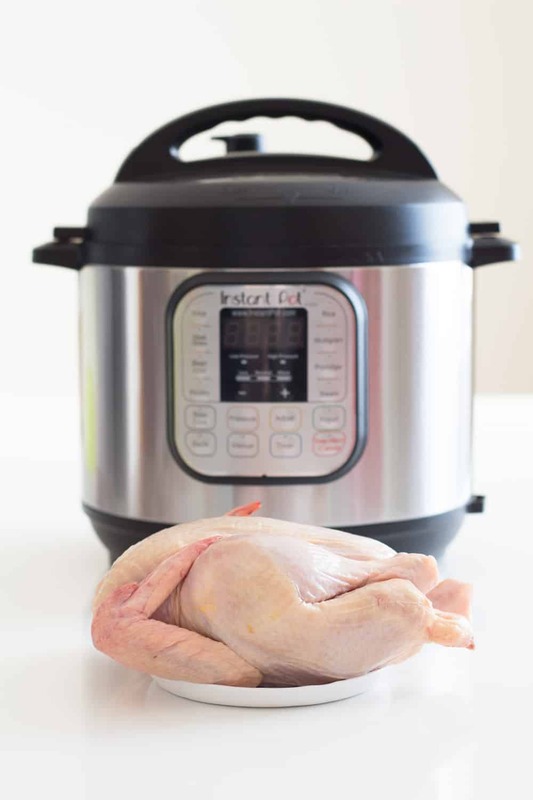 bag of skinned chicken leg quarters – how much water should I add and how long do I pressure cook it in my 8 quart Instant pot? The water is the same for 1 or 10 legs because the chicken isn’t in the water but on the trivet. The water is at the bottom not touching the chicken and the times “should” also be the same for 1 or 10 legs.